ACRN is type-1 hypervisor that supports running multiple guest operating systems (OS). Typically, the platform BIOS/boot-loader boots ACRN, and ACRN loads single or multiple guest OSes. Refer to Hypervisor Startup for details on the start-up flow of the ACRN hypervisor. ACRN supports two modes of operation: Sharing mode and Partition mode. This document describes ACRN’s high-level design for Partition mode support. In partition mode, ACRN provides guests with exclusive access to cores, memory, cache, and peripheral devices. Partition mode enables developers to dedicate resources exclusively among the guests. However there is no support today in x86 hardware or in ACRN to partition resources such as peripheral buses (e.g. PCI) or memory bandwidth. Cache partitioning technology, such as Cache Allocation Technology (CAT) in x86, can be used by developers to partition Last Level Cache (LLC) among the guests. (Note: ACRN support for x86 CAT is on the roadmap, but not currently supported). ACRN expects static partitioning of resources either by code modification for guest configuration or through compile-time config options. All the devices exposed to the guests are either physical resources or emulated in the hypervisor. So, there is no need for device-model and Service OS. Figure 110 shows a partition mode example of two VMs with exclusive access to physical resources. ACRN uses multi-boot info passed from the platform boot-loader to know the location of each guest kernel in memory. ACRN creates a copy of each guest kernel into each of the guests’ memory. Current implementation of ACRN requires developers to specify kernel parameters for the guests as part of guest configuration. ACRN picks up kernel parameters from guest configuration and copies them to the corresponding guest memory. ACRN requires the developer to specify the number of guests and the cores dedicated for each guest. Also the developer needs to specify the physical core used as the Boot Strap Processor (BSP) for each guest. As the processors are brought to life in the hypervisor, it checks if they are configured as BSP for any of the guests. If a processor is BSP of any of the guests, ACRN proceeds to build the memory mapping for the guest, mptable, E820 entries, and zero page for the guest. As described in Guest info, ACRN creates copies of guest kernel and kernel parameters into guest memory. Figure 111 explains these events in chronological order. Sum of guest PCI hole and guest “System RAM” is less than 4GB. Pick the starting address in the host physical address and the size, so that it does not overlap with any reserved regions in host E820. ACRN creates EPT mapping for the guest between GPA (0, memory size) and HPA (starting address in guest configuration, memory size). A default E820 is used for all the guests in partition mode. This table shows the reference E820 layout. Zero page is created with this e820 info for all the guests. ACRN, in partition mode, uses mptable to convey platform info to each guest. Using this platform information, number of cores used for each guest, and whether the guest needs devices with INTX, ACRN builds mptable and copies it to the guest memory. In partition mode, ACRN uses physical APIC IDs to pass to the guests. Port I/O is supported for PCI device config space 0xcfc and 0xcf8, vUART 0x3f8, vRTC 0x70 and 0x71, and vPIC ranges 0x20/21, 0xa0/a1, and 0x4d0/4d1. MMIO is supported for vIOAPIC. ACRN exposes a virtual host-bridge at BDF (Bus Device Function) 0.0:0 to each guest. Access to 256 bytes of config space for virtual host bridge is emulated. ACRN, in partition mode, supports passing thru PCI devices on the platform. All the pass-thru devices are exposed as child devices under the virtual host bridge. ACRN does not support either passing thru bridges or emulating virtual bridges. Pass-thru devices should be statically allocated to each guest using the guest configuration. ACRN expects the developer to provide the virtual BDF to BDF of the physical device mapping for all the pass-thru devices as part of each guest configuration. ACRN, in partition mode, supports an option to pass-thru LAPIC of the physical CPUs to the guest. ACRN expects developers to specify if the guest needs LAPIC pass-thru using guest configuration. 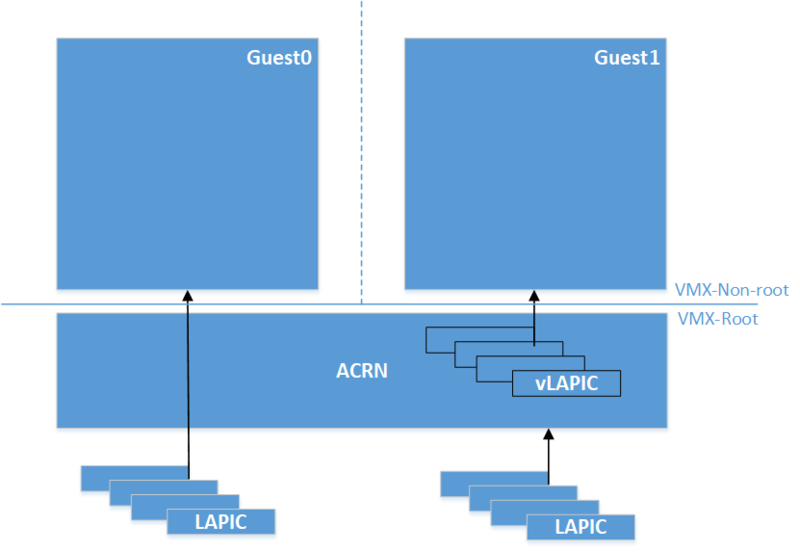 When guest configures vLAPIC as x2APIC, and if the guest configuration has LAPIC pass-thru enabled, ACRN passes the LAPIC to the guest. Guest can access the LAPIC hardware directly without hypervisor interception. During runtime of the guest, this option differentiates how ACRN supports inter-processor interrupt handling and device interrupt handling. This will be discussed in detail in the corresponding sections. The core APIC IDs are reported to the guest using mptable info. SMP boot flow is similar to sharing mode. Refer to VM Startup for guest SMP boot flow in ACRN. Partition mode guests startup is same as the SOS startup in sharing mode. For guests without LAPIC pass-thru, IPIs between guest CPUs are handled in the same way as sharing mode of ACRN. Refer to Virtual Interrupt for more details. ACRN supports pass-thru if and only if the guest is using x2APIC mode for the vLAPIC. In LAPIC pass-thru mode, writes to Interrupt Command Register (ICR) x2APIC MSR is intercepted. Guest writes the IPI info including vector, destination APIC IDs to the ICR. Upon an IPI request from the guest, ACRN does sanity check on the destination processors programmed into ICR. If the destination is a valid target for the guest, ACRN sends IPI with the same vector from ICR to the physical CPUs corresponding to the destination processor info in ICR. ACRN emulates Configuration Space Address (0xcf8) I/O port and Configuration Space Data (0xcfc) I/O port for guests to access PCI devices configuration space. Within the config space of a device, Base Address registers (BAR), offsets starting from 0x10H to 0x24H, provide the information about the resources (I/O and MMIO) used by the PCI device. ACRN virtualizes the BAR registers and for the rest of the config space, forwards reads and writes to the physical config space of pass-thru devices. Refer to I/O section below for more details. ACRN developers need to statically define the pass-thru devices for each guest using the guest configuration. 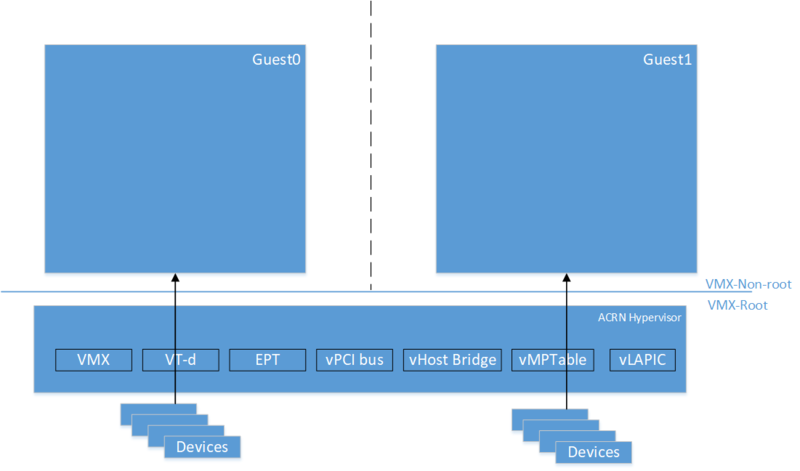 For devices to DMA to/from guest memory directly, ACRN parses the list of pass-thru devices for each guest and creates context entries in the VT-d remapping hardware. EPT page tables created for the guest are used for VT-d page tables. ACRN supports I/O for pass-thru devices with two restrictions. Supports only MMIO. So requires developers to expose I/O BARs as not present in the guest configuration. Supports only 32-bit MMIO BAR type. As guest PCI sub-system scans the PCI bus and assigns Guest Physical Address (GPA) to the MMIO BAR, ACRN maps GPA to the address in the physical BAR of the pass-thru device using EPT. Following timeline chart explains how PCI devices are assigned to guest and BARs are mapped upon guest initialization. ACRN supports both legacy (INTx) and MSI interrupts for pass-thru devices. ACRN expects developers to identify the interrupt line info (0x3CH) from the physical BAR of the pass-thru device and build an interrupt entry in the mptable for the corresponding guest. As guest configures the vIOAPIC for the interrupt RTE, ACRN writes the info from the guest RTE into the physical IOAPIC RTE. Upon guest kernel request to mask the interrupt, ACRN writes to the physical RTE to mask the interrupt at the physical IOAPIC. When guest masks the RTE in vIOAPIC, ACRN masks the interrupt RTE in the physical IOAPIC. Level triggered interrupts are not supported. 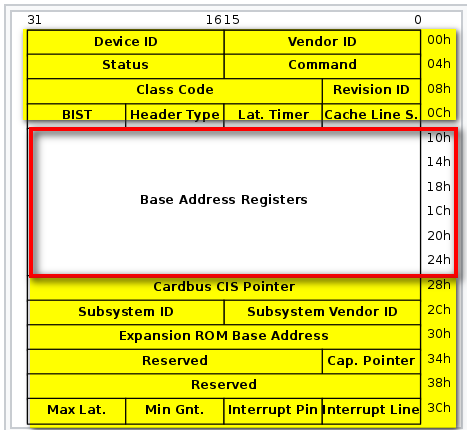 Guest reads/writes to PCI configuration space for configuring MSI interrupts using address. Data and control registers are pass-thru to the physical BAR of pass-thru device. Refer to Configuration space access for details on how PCI configuration space is emulated. ACRN provides read-only vRTC support for partition mode guests. Writes to the data port are discarded. For port I/O to ports other than vPIC, vRTC, or vUART, reads return 0xFF and writes are discarded. In partition mode of ACRN, interrupts stay disabled after a vmexit. The processor does not take interrupts when it is executing in VMX root mode. ACRN configures the processor to take vmexit upon external interrupt if the processor is executing in VMX non-root mode. Upon an external interrupt, after sending EOI to the physical LAPIC, ACRN injects the vector into the vLAPIC of vCPU currently running on the processor. Guests using Linux as kernel, uses vectors less than 0xECh for device interrupts. For guests with LAPIC pass-thru, ACRN does not configure vmexit upon external interrupts. There is no vmexit upon device interrupts and they are handled by the guest IDT. ACRN needs IPIs for events such as flushing TLBs across CPUs, sending virtual device interrupts (e.g. vUART to vCPUs), and others. Hypervisor IPIs work the same way as in sharing mode. 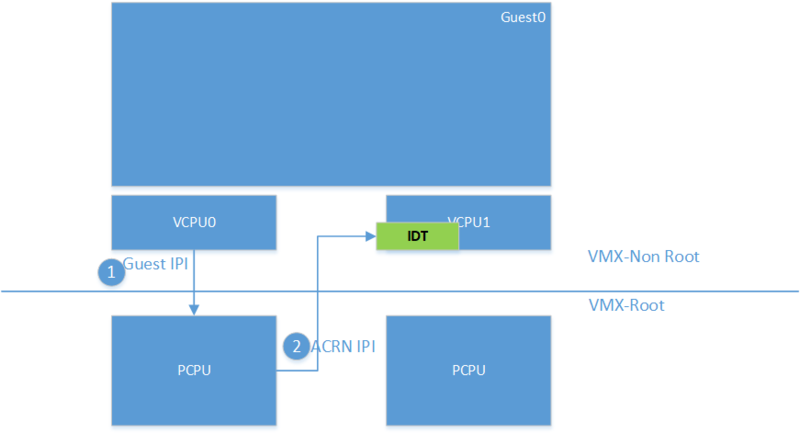 Since external interrupts are pass-thru to guest IDT, IPIs do not trigger vmexit. ACRN uses NMI delivery mode and the NMI exiting is chosen for vCPUs. At the time of NMI interrupt on the target processor, if the processor is in non-root mode, vmexit happens on the processor and the event mask is checked for servicing the events. For details on how hypervisor console works, refer to Hypervisor console. For a guest console in partition mode, ACRN provides an option to pass vmid as an argument to sos_console. vmid is same as the one developer uses in the guest configuration. Works the same way as sharing mode. ACRN uses TSC deadline timer to provide timer service. Hypervisor console uses a timer on CPU0 to poll characters on the serial device. To support LAPIC pass-thru, TSC deadline MSR is pass-thru and the local timer interrupt also delivered to the guest IDT. Instead of TSC deadline timer, ACRN uses VMX preemption timer to poll the serial device. ACRN exposes vUART to partition mode guests. vUART uses vPIC to inject interrupt to the guest BSP. In cases of guest having more than one core, during runtime, vUART might need to inject interrupt to guest BSP from another core (other than BSP). As mentioned in section <Hypervisor IPI service>, ACRN uses NMI delivery mode for notifying the CPU running BSP of the guest.